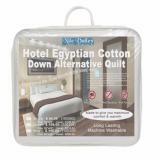 Nile Valley's Hotel Quilt rolled up a luxury blend making these more comfortable than regular quilts. Breathable filling with high thermal qualities. The quilt casing is made of 100% Egyptian Cotton with 400 Thread count and is fully pocketed with internal walls. This filling absorbs and transports body moisture, so you will feel warm and comfortable in winter and cool in summer. Made for hotels to give maximum comfort & long lasting use. The right protection for that premium-quality ensures lasting luxury for years to come. Treated with mite guard. All our quilts contain fillings that have been sterilised and steam purified with highest standards making them hypoallergenic. Add the finishing touch to your bedroom with these durable Nile Valley's Hotel quilts. Featuring a lasting fill, these hotel quilts will hold their shape for many nights and will remain firm. Premium-quality ensures lasting luxury for years to come. I just receive it,feel like polyester not micro fibre .beware. 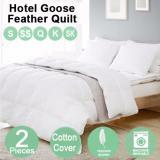 Nile Valley's high quality 5 star hotel feather quilts. 2 Pieces. With Mite Guard. 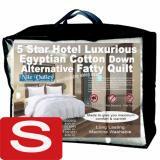 Nile Valley's 5 Star Hotel Luxurious Egyptian Cotton Fatty Quilt For Good Night Sleep.